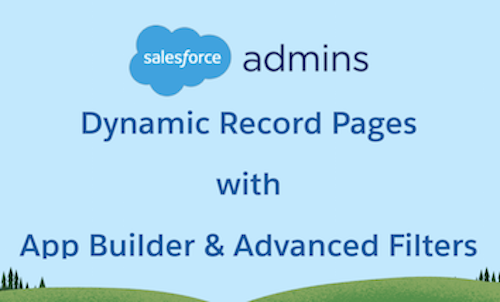 As an #AwesomeAdmin, you may have all the technical tools and skills for your project. But, just as critical is how you manage alignment, expectations, communication, and collaboration across your user groups and stakeholders. Yes, you guessed it right, I am talking about managing change. Specifically, I’m talking about managing the change your users will experience when they move to Lightning Experience. Our team works to build products that help users move to Lightning Experience. We want you, #AwesomeAdmin, and your company, to reap all the benefits it has to offer by helping you understand the factors that are often overlooked yet crucial for success. Let’s make your transition to Lightning Experience a roaring success! Why is the human aspect of change management important? Simply put, your transition project is at risk if you are not well prepared to manage the human aspect of this change. Let’s take a step back and look around. Change impacts us every day – at work, home, family etc. We are constantly surrounded by change, but often our initial reaction is to resist or ignore it. (For example, recall how often you postpone that update to your smartphone…) Well, you are not the only one to feel that way! It’s a natural human reaction to resist change as it brings lots of unknowns and questions to our minds. Now consider the impact of moving your org from Salesforce Classic to Lightning Experience. It means a big change for your users! It is expected that they will have a typical reaction—confusion, questions, or even resistance. 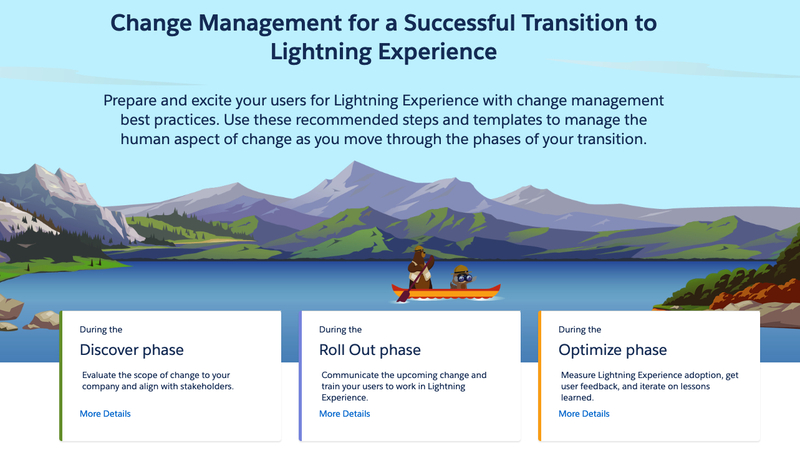 I’m excited to let you know about a great tool that provides step-by-step guidance and resources for managing the human aspect of your transition to Lightning Experience. 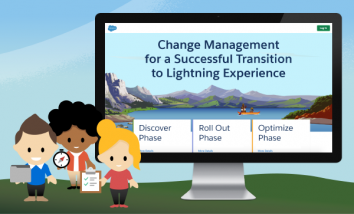 Introducing the Lightning Experience Transition Change Management Hub! 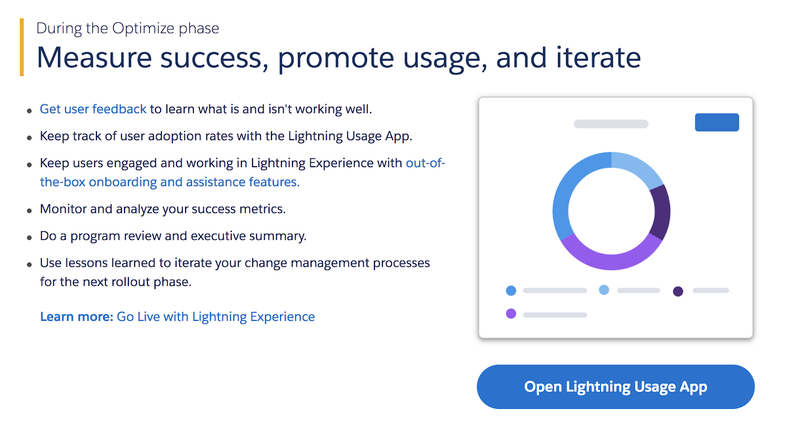 A typical transition to Lightning is conducted in three phases: Discover (where you make the case and assess your org’s readiness), Roll Out (where you address technical requirements then go live), and Optimize (where you monitor adoption progress and iterate on lessons learned). The Change Management Hub recommends best practices for managing change throughout each phase and provides tools and templates to ease the process for you and your users. 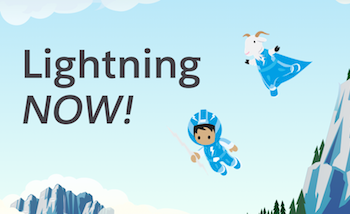 In the early stages of the transition, find out how users feel about your current Salesforce implementation and what their impressions of Lightning Experience are. This is also the time to work with your executive sponsor and key stakeholders to get alignment and commitment to your change management strategy, as well as your overall rollout plan. Assessing how the shift to Lightning Experience will affect your company helps you anticipate potential adoption blockers. The Change Management Hub gives you easy access to the Lightning Experience Enablement Pack, which is chock-full of customizable templates and other resources to help with these, and future change management activities. In the Roll Out phase, you’ll prepare to go live by deciding which teams to switch first and working on your implementation to address technical requirements. But, this is also the time to prepare users for the coming change. Change management at this point is all about communication, collaboration, training, and even a little bit of marketing. Set up a central place for communicating with users by creating a Chatter group for your rollout. The Hub even provides a welcome message template to help kick things off on the right note. 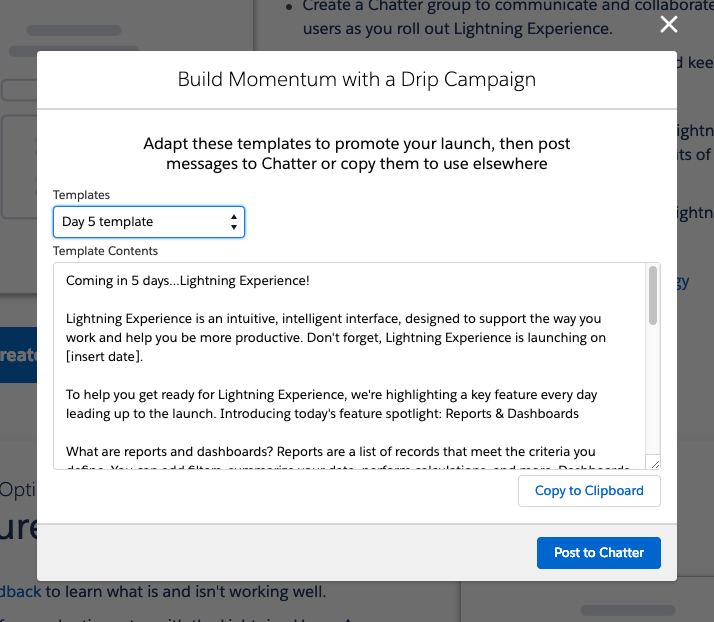 Create some buzz by running a drip campaign to promote your launch and the benefits of Lightning Experience. 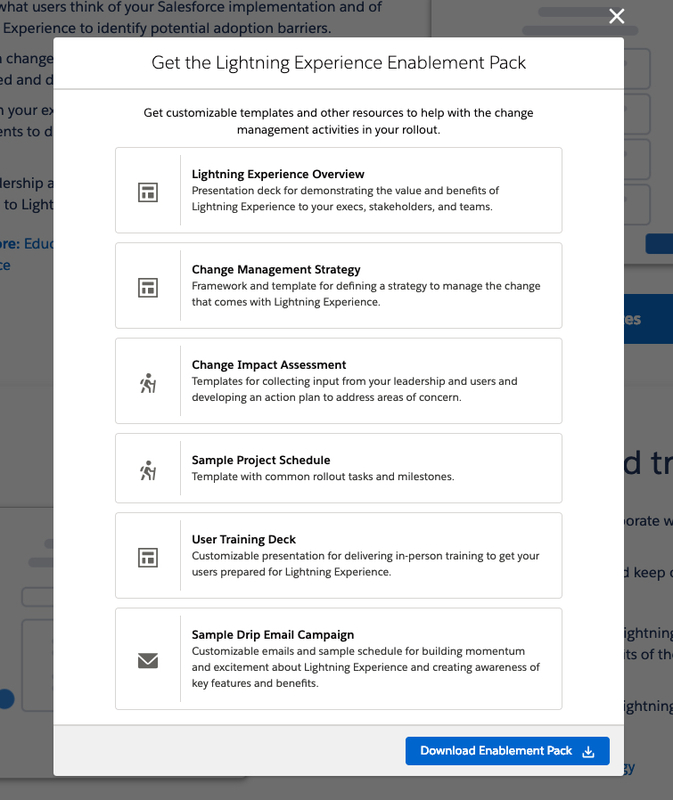 The Hub includes several campaign templates that highlight key Lightning Experience features. Tailor the messages to your business then use the Hub to quickly share them on Chatter or in other communication channels like email. Prepare your users to work in Lightning Experience so they’re comfortable and productive from day one of your launch. The Hub provides access to Trailhead content that’s designed for self-paced training. There is also a customizable training deck if you want to deliver in-person guidance. Change management doesn’t end when you go live with Lightning Experience! Post-launch is a critical time to make sure users stay engaged and are getting what they need from the new interface. The Change Management Hub recommends options for collecting feedback so you can evaluate satisfaction rates and identify problem areas in your implementation. The Hub also provides fast access to the Lightning Usage App, where you can monitor adoption rates and user turn-back to Salesforce Classic. This is also the time to do a program review with your stakeholders and iterate your change management plan for the next phase of your rollout. Oh, and take some time to celebrate your achievements and successes! You’ll notice that the Hub includes several links to Trailhead modules for extra help throughout the transition, including links to the newly released Transition Assistant hub. The best part is that this is all free! 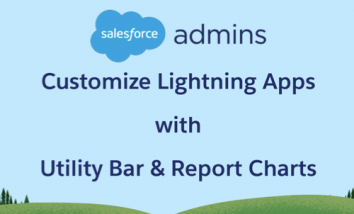 Make the most of these resources to achieve phenomenal success in your transition to Lightning Experience, and be the Awesome Admin you are! Don’t forget to provide us with your feedback using the links at the bottom of the Change Management Hub, too. We’d love to know what you like and what we can improve. Wishing you the best on your journey to Lightning Experience! 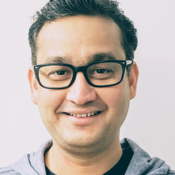 Niket is a Director of Product Management at Salesforce. He is passionate about building products that have an impact on how individuals and organizations grow, connect and be more productive.